There are no inter-city passenger train/rail services to and from - Paihia (Bay of Islands), Kerikeri (Bay of Islands), Whangarei, Tauranga, Rotorua, Taupo, Gisborne, Napier, Hastings, New Plymouth or Wanganui. For fare and timetable information for suburban passenger rail train services in the greater Auckland region, please phone Auckland Transport on 0800-103-080 tollfree in the Auckland region only or click for online train timetables and fares on the Western, Southern, Eastern, Onehunga and Manukau lines only. There are no passenger train or rail services from Auckland to Paihia (Bay of Islands), Auckland to Whangarei, Auckland to Taupo, Auckland to Gisborne, Auckland to Napier/Hastings, Auckland to Tauranga or Auckland to Rotorua except for the daily bus and scenic coach services. For Wellington suburban train fare and timetable information, please phone Metlink on 0800-801-700 tollfree in New Zealand or click for online train timetables on the Johnsonville, Melling, Kapiti, Hutt and Wairarapa Lines only. 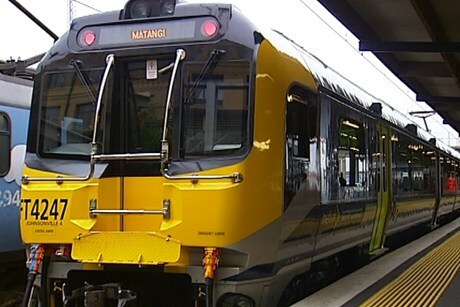 For timetable and fare information for The Capital Connection (Wellington/Waikanae/Otaki/Levin/Palmerston North) and The Wairarapa Connection (Wellington/Featherston/Carterton/Masterton) train services, please phone Metlink on 0800-801-700 tollfree in New Zealand or click for online fares and timetable information for the Capital Connection or the Wairarapa Connection. The Capital Connection and The Wairarapa Connection train services are commuter rail services, so reservations are not required. Tickets for these trains are available from Tranz Metro ticket office - Wellington Railway Station, Masterton Railway Station, Featherston Railway Station and Palmerston North Railway Station or from the respective Train Manager's on the day of travel. There are no passenger train or rail services from Wellington to Napier or Hastings, Wellington to New Plymouth, Wellington to Wanganui, Wellington to Taupo, Wellington to Tauranga or Wellington to Rotorua. The Northern Explorer train service is a scenic rail journey through the heart of the North Island travelling between Auckland, New Zealand’s largest city and home of the Sky Tower, to Wellington, New Zealand’s arts and culture capital. You see fantastic views of New Zealand farmland, the volcanic plateau, Mount Ruapehu, the world famous Raurimu Spiral, and stunning river gorges – all from our panoramic windows or open air viewing decks allowing you the best possible views. All carriages on the Northern Explorer train are centrally heated/air conditioned, with forward facing seats with head rest or 'Table Group' (4 people around a table) seating, with large panoramic windows giving sweeping views of the magnificent North Island. The Northern Explorer train has a Café Carriage, offering a range of alcoholic and non-alcoholic drinks, snacks and light meals and a viewing platform. The Northern Explorer train is a reserved seating 'One Class/Non-smoking' service. The Northern Explorer train does not operate of Christmas Day - 25 December. There is no overnight passenger rail or train service between Wellington, Palmerston North, Ohakune, National Park, Hamilton and Auckland.